We are extremely proud of the launch of a new pilot programme for Palmusic UK. 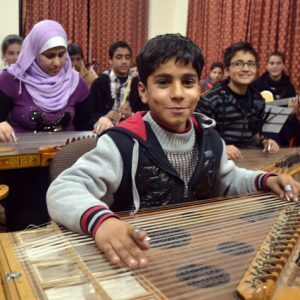 In collaboration with the Trinity Laban Conservatoire of Music and Dance (London) and many teachers from the UK, we are introducing a long-distance video training for the ESNCM Gaza Music School. Through digital audio-visual technology teachers and students in Gaza will be trained by expert teachers in the UK. The current blockade and siege which Gaza has been under for more than 10 years now, makes it impossible for the conservatory branch to have access to essential training and development. The remote learning will give the chance to students and teachers to develop the skills they need to improve their musical capacity. We hope that this will be the first of a numerous and successful series.